Summary: After the sudden death of her father, Annie Daschle, her mother, and her two sisters find themselves having to move in with estranged family in New York. Annie, who is 18 and who has spent her life in a small Texas town being extra sheltered due to a congenital heart defect, is ready to make the most of their new life and is armed with her dad's old camera and a list of ways she wants to live out loud. Starting with, getting a job for the first time ever. And then she literally runs into one of the managers at bookshop/bar, Wasted Words. Greg Brandon, who never really notices any women, finds himself inexplicably drawn to Annie's sunshine and passion-filled approach to life. However, Annie's heart has always had a mind of its own. Summary: This was so good. It was so, so good. While I LOVE me some Colonel Brandon, Marianne has never been my favorite, but I think this retelling was done REALLY well. First of all, the age difference. In S&S, Brandon was twice Marianne's age, and I'm sorry, I could never really get behind that, no matter how amazing a human the Colonel is. Like, maybe because I kind of find Marianne a little difficult to like (even though I feel bad for what she goes through), I've always been unable to see what Brandon, a man in his mid-thirties, found so compelling about Marianne, who is still a child at 17, that he would want to marry her. I mean, that's not the same as being even 20 and 37, you know? Though, hey, maybe 17-year-olds were more adultish in the late 1700s, IDK. In this book, Annie is 18 (and has already graduated high school), and Greg is 28, which is not SO bad, though, still squicky to me (as someone who teaches high schoolers). However, I find that Hart did a really good job of making Annie likeable. She's still fairly naive and has a lot to learn, but she loves to wax poetic about life, and she just has this sincere awe of the world that I think has more in common with an entirely different literary heroine of a similar name. And given her heart condition, her personal traits mean something different--she has a reason for feeling so strongly about everything. I like how Greg is definitely very human. (I mean, yeah, if you're gonna cast Alan Rickman in a role, he's going to come across as like, the most perfect man ever.) This book is told in alternating POVs, so we see a lot more of him and his story and also his feelings when we get to all the Willoughby stuff. We see how conflicted he feels about her age, but we also see how he falls utterly in love with her--this is not a case of "I've got the hots for this 18-year-old, and my body lusts for hers," but it really was a beautiful, poetic meeting of souls. It's never crass, never base. (It doesn't mean that there isn't attraction, either, but let's just say that Hart does a good job of showing us that this is an elevated, deeply emotional attraction.) Whereas I never fully felt quite convinced about Marianne and the Colonel, I SHIPPED THIS SO HARD. All the other elements of S&S were adapted really well, I think, with the back story of the Daschles and how they found themselves in dire straits, but then ended up in New York. It was very clever. Given that, you're probably asking, WHAT ABOUT ELINOR AND EDWARD? 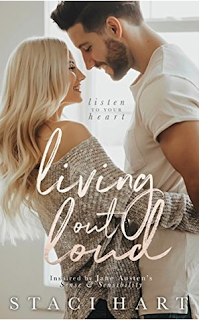 Well, Elle and Ward are definitely introduced in this book, but their story will be in Hart's next book in this series. While I love Colonel Brandon and don't quite love Marianne, I also love Elinor and don't quite love Edward, so let's see how this goes. I NEED IT NOW. PS--Fanny is still named Fanny, and she's as awful as expected.